Aerospace and Defense | ESRD | Engineering Software Research and Development, Inc.
ESRD’s software products and consulting services provide crucial support to a variety of aerospace and defense systems, enabling contractors and engineers with the tools, strategies and methodologies required to perform engineering simulations that are Simple, Accurate, Fast, Efficient and Reliable (S.A.F.E.R.) for the occasional user as well as the expert. 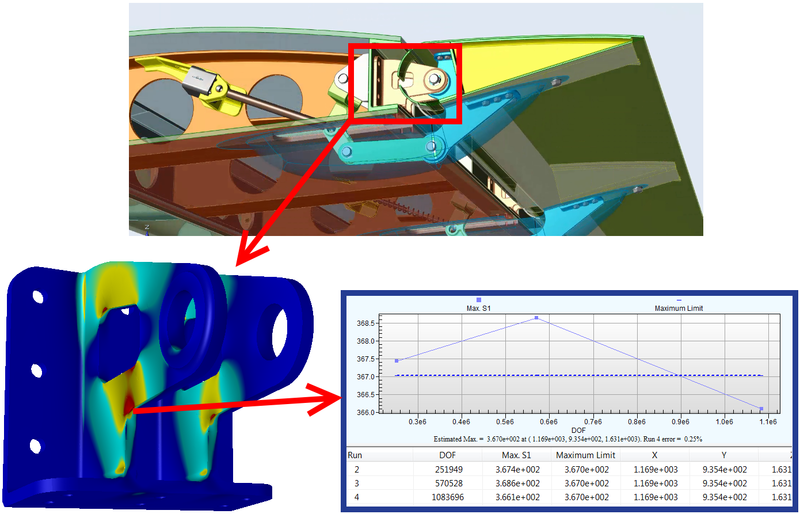 In the Aerospace & Defense application demo shown below, ESRD and our partner Altair collaborated on a global-local workflow for an aero wing flap hinge fitting detailed stress analysis (model and input data courtesy of Altair). Here are a few of the aviation, aerospace, and defense programs to which ESRD has contributed our simulation software, engineering consulting, or research & development expertise.